While other companies succeed by salvaging lumber from old barns and similarly disused buildings, Maine Heritage Timber reclaims wood from a forest underwater. In remote Millinocket, ME, there are as many as 1 million cords of wood resting at the bottom of Quakish Lake. Since 2009, Maine Heritage Timber has been pulling those logs out of the water, then milling them into flooring, tabletops, furniture—a diverse range of wood products, all sharing a remarkable backstory. Back in the early 1900s, logging was big business in eastern Maine. 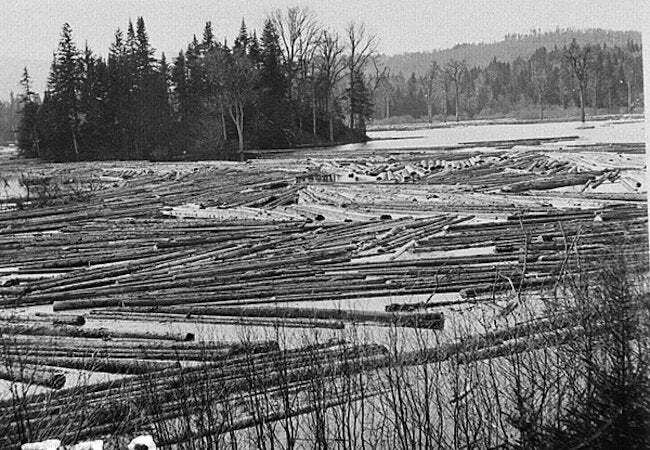 Since interstates and railroads had not yet criss-crossed the country, rivers were the primary means of transporting felled trees. At the time, Quakish Lake, part of Penobscot River system, served as a holding area for logs en route to the Great Northern Paper Company. And while much of the old-growth wood successfully made its destination, some of it sank and sat, silently and untouched, for a hundred years. You might think that, after so long in the depths, those sunken timbers would emerge degraded and useless. But if anything, those logs were benefited by all that time spent underwater. The deep, cold lake water—and the absence of sunlight, oxygen, and pests—worked to preserve the wood, leaving it strong and in virtually pristine condition. And as a result of the wood’s prolonged exposure to water, many logs developed truly unique, seldom-seen, non-duplicable hues and patinas. Maine Heritage Timber employs heavy machinery to excavate, then sends the wood to shore on a barge, where it’s kiln-dried. Only then does the company know what can be made of the haul. But everything pulled from the lake is somehow put to use. 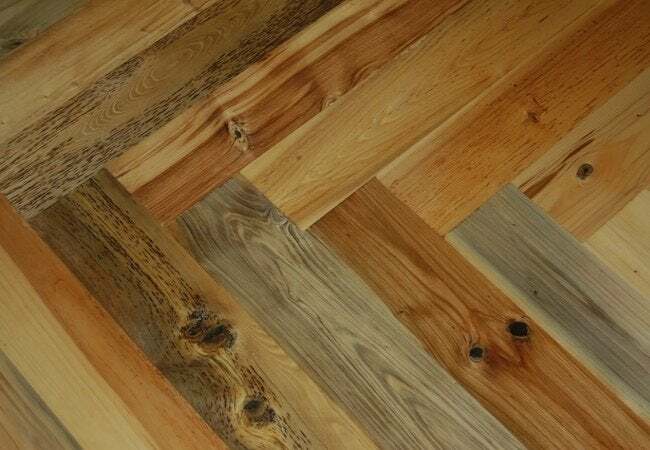 The best and most suitable wood becomes board lumber for the company’s consumer products, including flooring and wainscoting. Meanwhile, the unusable wood gets ground into pulp (sold to mills) or biomass (sold to the energy industry). The shavings are sold for animal bedding, and even the rocks that are uncovered are washed clean and sold to local landscaping outfits. 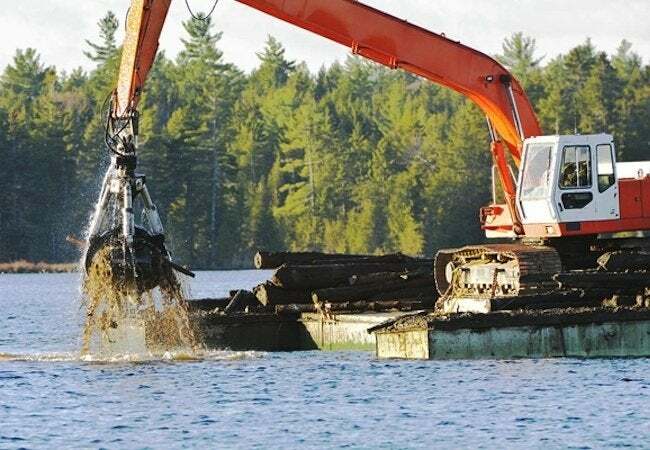 Though Maine Heritage Timber expects to continue work here for at least another 20 years, no one knows exactly how much wood lies at the bottom of Quakish Lake. Amid the uncertainty, one thing is abundantly clear: The company’s customers get wood that boasts, not only rare beauty, but a fascinating history as well. 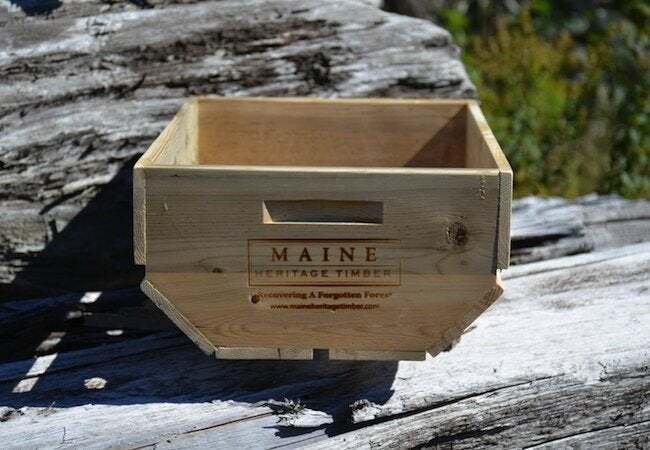 For more information, visit Maine Heritage Timber.